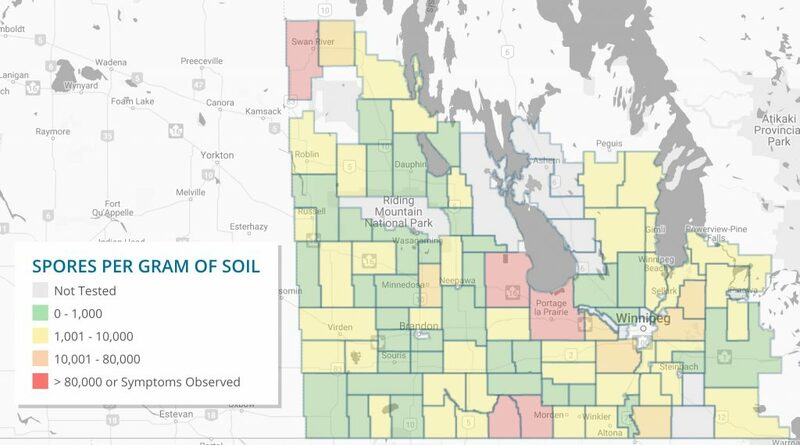 Manitoba’s Pest Surveillance Initiative Lab has been running soil samples and has created a Clubroot map that shows positive clubroot (CR) findings by Rural Municipality in Manitoba. Clubroot is a serious soil-borne disease of cruciferous crops. In canola, it causes galls to form on the roots, which ultimately causes premature death of the plant. Currently, there are no economical control measures that can remove the disease from a canola field once it has been infected. However, it is possible to prevent the spread. Sanitation and managing infected fields through crop rotation are the most effective methods of prevention. Clubroot had been seen before in cole crops across Canada; it has been recognized as a problem in Brassica vegetable crops (e.g. broccoli, cabbage, radish, rutabaga) in Ontario, Quebec, British Columbia, and Atlantic Canada for several years. However, the first report of this disease in a commercial canola field in western Canada occurred near Edmonton, AB in 2003. Since then, more infested fields have been identified in central Alberta each year. Clubroot is now found in fields in Saskatchewan and Manitoba as well.